Nice little way to remember the 7 steps of hand washing!! Welcome to our new Corporate Member, CPL/Servisource! What are the benefits associated with these Healthcare Assistant jobs ? What are the requirements for these Healthcare Assistant jobs ? FETAC/QQI Level 5 in Healthcare Support/Pre-Nursing Studies (or equivalent) – 2nd or 3rd Year STUDENT NURSES are also eligible to apply! Welcome to our new Corporate Member, Highfield Healthcare! Highfield Healthcare now has 4 facilities and a total complement of 313 beds and is highly regarded for the provision of acute mental health treatment and care for adults and older persons with acute, serious and enduring mental health disorders and complex mental health issues associated with neuropsychiatric disorders and dementia. At Highfield Healthcare we foster an environment that is based on great people and exceptional patient care. Whether you are employed in one of our long stay residential units or in our acute adult mental health hospital you will be part of a team of professionals who are progressive and innovative in their delivery of care. We respect the individual and recognise that our greatest strength lies with our people. We are always looking for energetic and talented individuals with a desire to make a difference in the delivery of world class care. In whatever capacity, you choose to join the Highfield Healthcare team, you’re here to make a difference. We’ll encourage your growth with educational options. We’ll value your input and feedback and support your curiosity to explore new professional avenues. We are always happy to hear from candidates interested in working with us. 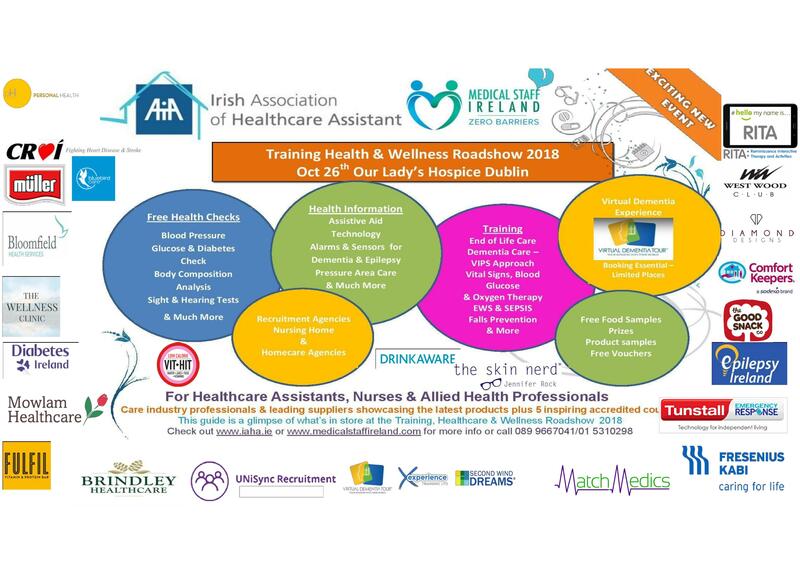 Super excited to announce our Training, Health & Wellness Roadshow for Healthcare Assistants, Nurses & Allied Health Professionals. Upskill, get a free health check, sample free food, try out the latest products & free prizes .. join us for a Positive, Inspiring and Energising day!! 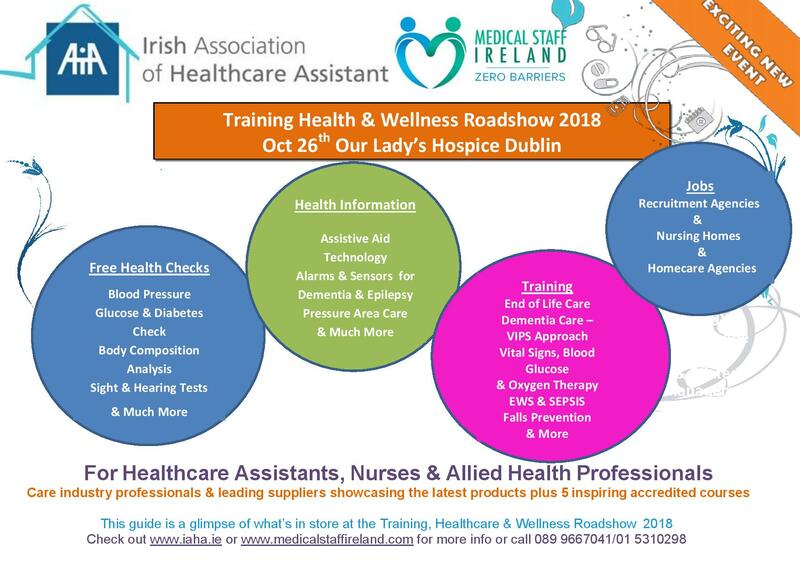 We are super excited to announce our Training, Health & Wellness Roadshow for Healthcare Assistants, Nurses and Allied Health Professionals. This is an opportunity to upskill, get a free health check and sample free food, try out the latest products and therapies enter for prizes (proceeds go to Our Lady's Hospice Dublin)... join us for a Positive, Inspiring and Energising day!! For exhibitors that this would be an ideal opportunity to engage face to face with your target audience and offers maximum exposure to collect high quality leads and create new business opportunities. Candidates: Candidates for this course are expected to have a QQI Level 5 Healthcare Qualification, CPR/AED & be working in a health care setting. This course is aimed at health care workers who are required to record and report clinical observations and carry out blood glucose checking in their place of work. All our Trainers are experts in the field of Healthcare, Safety and Emergency Care and are recognised by the Irish Heart Foundation, Pre-Hospital Emergency Care Council, Health & Safety Authority, and other national and international organisations. We bring realistic training, relating real life events into the classroom. It is usually a healthcare assistant who notices when a patient 'just doesn't look right'. If they notice a patient is acting funny, their observations are changing, or something just isn’t right, it is the nurse’s job to respect that observation and investigate. 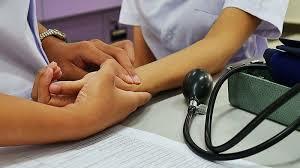 The assessment of a patient is one of those tasks that cannot be delegated, but this doesn’t mean that a care assistant can’t notice problems and escalate them to you. Ignoring these escalations could lead to poorer patient outcomes and a sense of disrespect for the healthcare assistant. 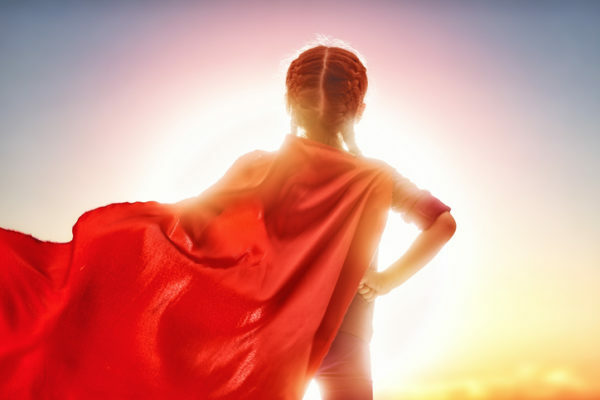 You should empower your healthcare assistants to be your eyes and ears. If they think something if wrong - listen and investigate. Healthcare assistants and clinical support workers have started to undertake lot of advanced roles for little or no extra reward; venepuncture, cannulation, ECGs, catheterisation, feeding, wound assessments, pressure area care - list is endless. If they help you out by doing one of these for you, make sure you say thank you. Generally these 'extra roles' are not within their job description so are performing these tasks out of choice. You communicate with the doctors, the patients, the family, and other nurses, but how well do you communicate with your healthcare assistants? Healthcare assistants are a vital part of the team, not only for the work they do and the observations they make, but because the whole system would fall apart without them. There is no proverbial 'i' in team. Include healthcare assistants in care planning and ask their opinion. They have a wealth of knowledge that should be respected. See 'Listen to their observations'. Nurses know very well what it is like to have someone look past you, to feel like you don’t matter, and that your input isn’t valuable or welcome. 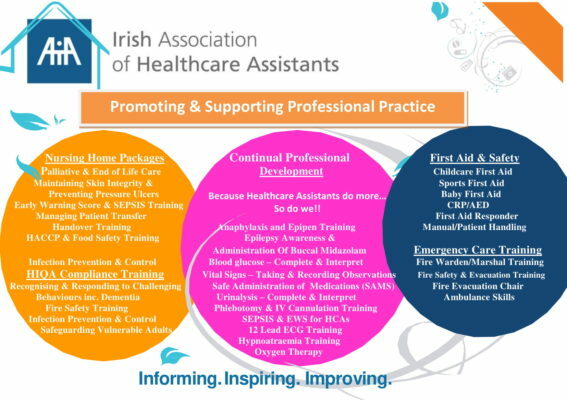 Healthcare assistants are the backbone of the HSE. They are responsible for the dirtiest jobs, the most difficult ratios, and get the least amount of pay and respect. Those two words mean a lot! A simple 'thank you' lifts the morale of, not only the healthcare assistants, but your whole team. It can make a massive difference even after those exhausting shifts. Because HCA’s do more ….. So do we!!! 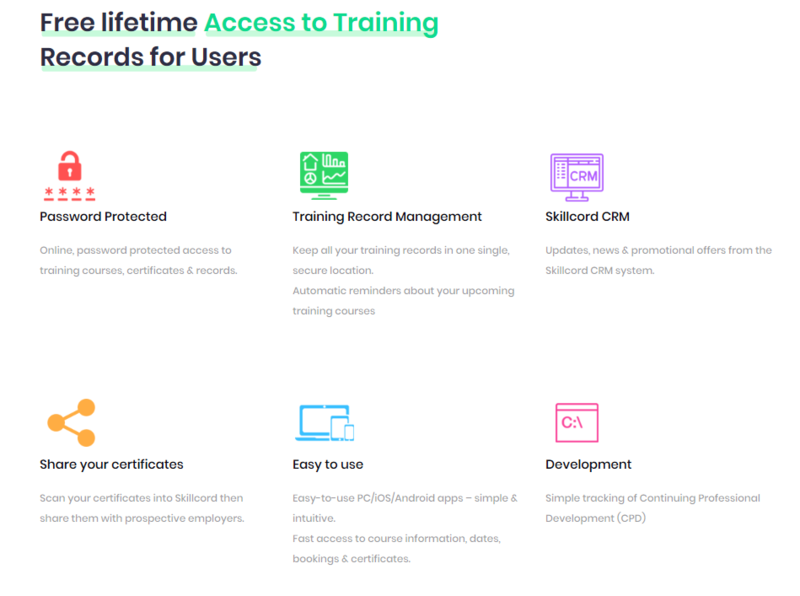 We are excited to introduce our new range of Healthcare Training!!! Now Healthcare Assistants are far more versatile in the work they do. Not only do they work in the traditional Nursing Home or Homecare setting but in Hospitals, MRI Clinics, Emergency Departments, Palliative Care, Maternity Care, Phlebotomy Outpatients, Endoscopy & Oncology departments to name but a few. We provide training to support the Healthcare Assistant in whatever role they choose. Fast-track your way to a career in Medical Reception! This pathway program combines the Certificate in Medical Reception and the Diploma in Business Administration to give you the confidence to interview for the role as a Medical Receptionist, whilst providing you with qualifications to climb the ladder.